Interstate H-201 supersedes Hawaii 78 along the Moanalua Freeway between the Halawa Interchange at Aiea and Kalihi by Fort Shafter Military Reservation. 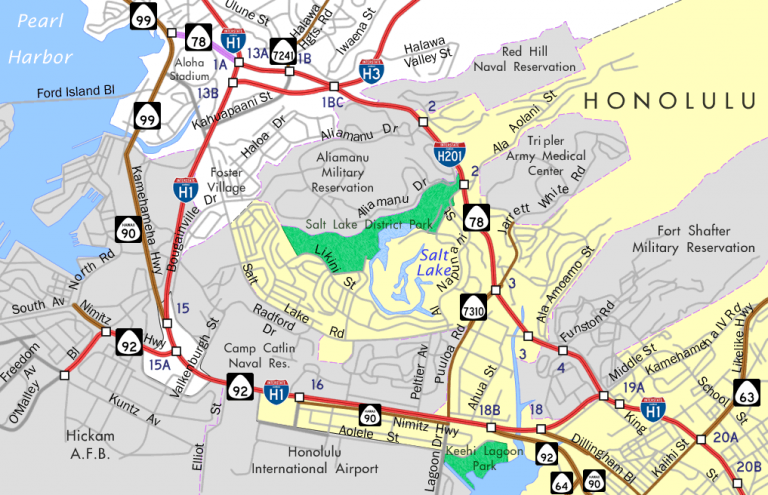 IH-201 lines all of the Moanalua Freeway with the exception of the western 0.7 miles between Kamehameha Highway (Hawaii 99) and the Halawa Interchange. The urban freeway constitutes a commuter route between Downtown Honolulu and points along Interstate H1. The freeway also serves Aliamanu Military Reservation, Tripler Army Medical Center and Fort Shafter in addition to the Salt Lake area. Connections at the west end also provide direct access to Aloha Stadium. The easternmost portion of the Moanalua Freeway was completed in 1959-60 and signed as Hawaii 72. This stretch, between Puuloa Road (Exit 3) and Middle Street, was renumbered to Hawaii 78 when Interstate H1 was designated. 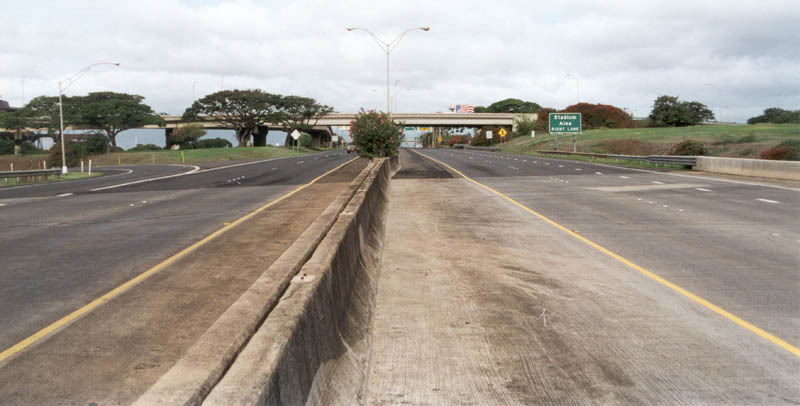 The remainder of Moanalua Road was upgraded to freeway standards during the 1980s. 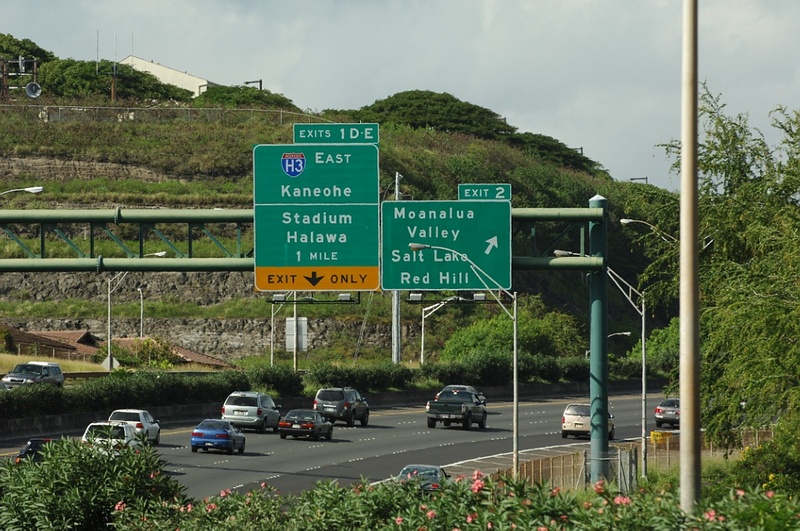 This led to the Federal Highway Administration incorporating the freeway to the Interstate system on February 1, 1989.2 Hawaii submitted Interstate H-1A as the designation for the route to AASHTO on June 2, 1990. Action was withheld at that meeting. 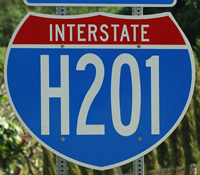 A subsequent application to AASHTO on December 8, 1990 resulted in the approval of Interstate H-201 instead of either Interstate H-1A or Interstate H-101. 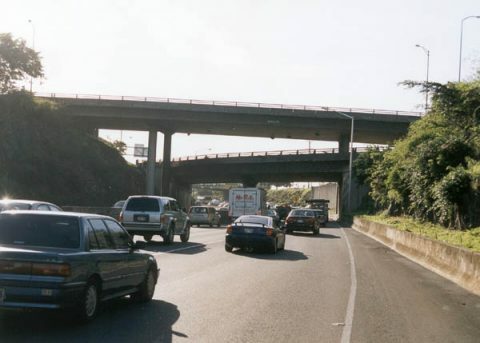 The Moanalua Freeway transitioned to Moanalua Road, an at-grade boulevard, west from Kikowaena Street in 1968. The Halawa Interchange between Interstates H1, H3 and H201 was built partially in place of the U.S. Navy Halawa Housing area. 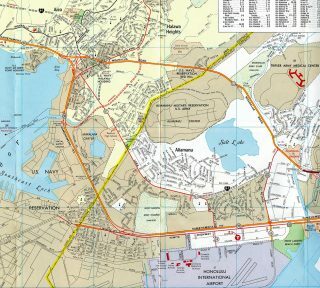 Freeway construction also severed the former route of Hawaii 71 (Halawa Heights Road), with Kahuapaani Street replacing it as the through route south to Salt Lake Boulevard. During a “superpave” project along Interstate H-201 (Hawaii 78) in July 2004, night time closures resulted in the placement of new I-H201 signs in both directions of the Moanalua Freeway.2 Photo taken by Brian Galapin. Exit 2 serves Moanalua Valley, Salt Lake and Red Hill. 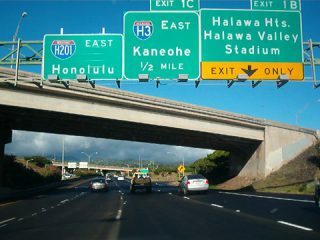 The succeeding two exits along westbound Interstate H-201 connect with Interstate H-3 and Ulne Street west to Aloha Stadium and Halawa Heights Road. Photo taken by Jeff Royston (02/01/06). 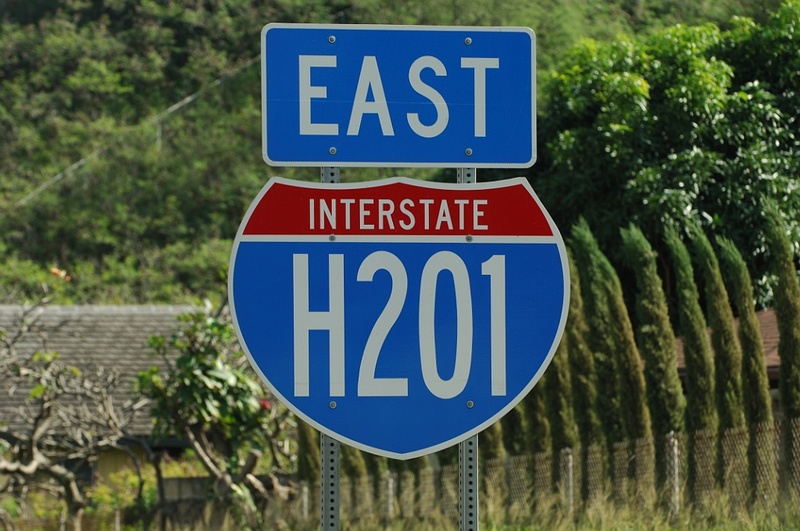 Westbound Interstate H-201 spurs west of Interstate H-1 to conclude at Hawaii 99 (Kamehameha Highway) ahead of Pearl City. Photo taken by Oscar Voss (11/01). 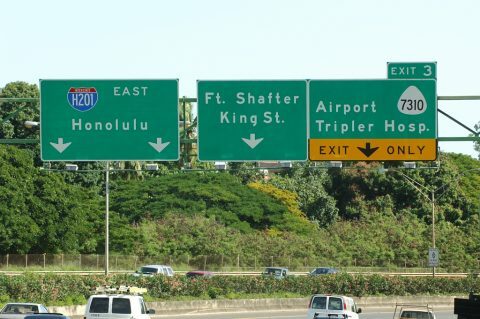 Interstate H-201 (Moanalua Freeway) merges onto I-H1 eastbound beyond the ensuing ramps for Hawaii 7310 (Jarrett White Road) and Funston Road to Fort Shafter. Photo taken by Jeff Royston (02/01/06). Interstate H-201 defaults onto I-H1 eastbound toward Downtown Honolulu at the exchange with Middle Street. Photo taken by Oscar Voss (11/01). Voss, Oscar. “Interstate H-201 update.” Online posting, misc.transport.road, September 17, 2003. “Moanalua is actually part of interstate.” Honolulu Star-Bulletin (HI), July 27, 2004.